On Top of the World: My first blog award! 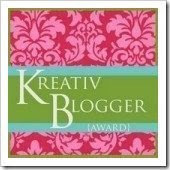 I found out over at Striving For a Simple Life that I've been given the Kreativ Blogger award! Huzzah! I'm right proud of this, given that On Top of the World is pretty new to the blogging scene, and it makes me happy to know that people are reading and enjoying the things I have to say. Part of this award involves me telling you all seven things you don't know about me. The hard part of this is trying to find things that I may not find cause to mention here otherwise! But here goes! 1. My obsession with Laura Ingalls Wilder started when I was about 8 years old. Through all these years, the obsession hasn't waned, and I still consider her a hero and role model. 2. I have Tourette Syndrome, and yes, that includes the occasional verbal tick. There's a reason my friends sometimes joke that I'm "barking mad." 3. I can knit lace shawls but can't make a simple crochet stitch to save my life. 4. I have a weakness for dill pickle popcorn seasoning, pink lemonade, and British chocolate. Not all at the same time, mind you. 5. I love watching Japanese horror movies, though they often scare the crap out of me. 6. I'm a terrible procrastinator. That's one of the reasons I got this blog. It's a lot easier to commit to doing something when I've already announced it and a bunch of people know about it. Sam, of It's Me, Sam!